Private Drama Events gets the front page of the Guardian for the launch of Westgate. “We are the controllers of the funfair, of the rabbit hole…of the dreams,” cries an eccentrically costumed showman as a three-dimensional kaleidoscope whirls into life. The ride is one of the Alice’s Adventures in Wonderland-themed theatrical “experiences” designed to inject some pizzazz into the opening of Westgate Oxford, the £440m shopping centre that has replaced the city’s rundown 1970s scheme. The spinning wall of coloured mirrors has a dizzying effect; when the ride ends, you stumble out blinking like a modern day Alice. It’s not Wonderland – the huge John Lewis in front of you confirms that. 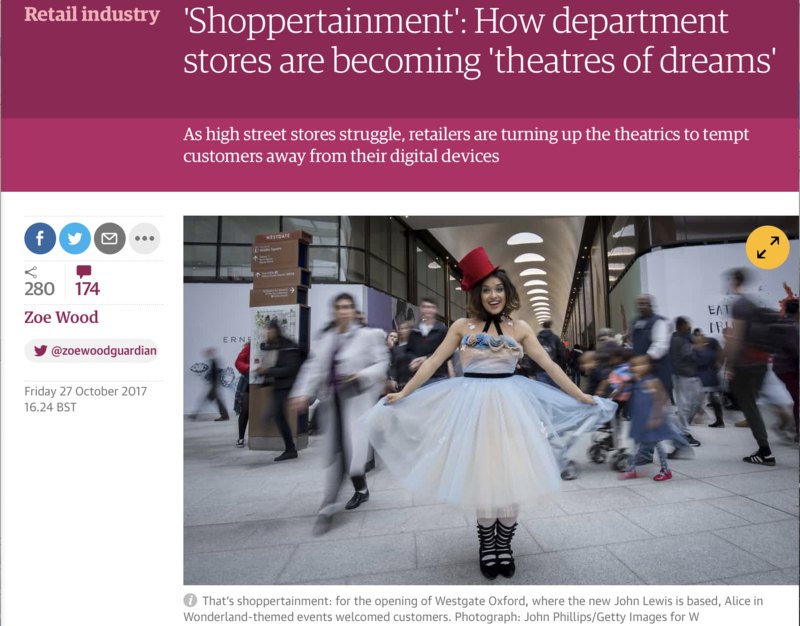 Rather, you have entered the realm of “shoppertainment”, a brave new world where retailers aren’t just in the business of trying to sell stuff – they are in showbusiness.